Venite Adoremus – “O Come Let Us Adore Him;” so goes the refrain of that well-loved hymn Adeste Fideles, “O Come All Ye Faithful.” As often as this hymn is sung, we can imagine accompanying the shepherds as they go running through the streets of Bethlehem or the Magi, wise men crossing impossible distance and terrain, to reach the Christ Child on bended knee humbly petitioning the Blessed Mother “O come, let us adore Him.” What is the reason for their haste and the purpose of their visit? They have certainly not come just to observe or to satisfy their curiosity. And the gifts they present to the child are more than just gestures of friendship and salutary presents. They have come to do what is at the very heart of our Christian faith– they have come to worship the Lord. Several thoughts come to mind on this Solemnity of the Epiphany, the Manifestation of the Lord, but this year I would like to approach this meditation from one angle: the importance of worship in the story of Jesus' epiphany for our modern world, and in particular, for all disciples of Christ. Unfortunately, the worship of God has become a secondary focus, even for many who consider themselves as part of the Church. Even within the Church, the liturgy often seems to rank last of all among its many activities. To modern man, worship seems altogether insular, anti-social and a waste of time. Just observe the number of times you have looked at your watch in the course of this mass. Today, you are most likely going to encounter a greater amount of discussion on solidarity with the poor or even the task of evangelisation, reaching out to one’s neighbours. To be sure, these things are very important. But I guess we have forgotten that worship is more important. In fact, worship is the first and chief work of the Church. Today’s feast therefore is an apt reminder that we need to restore the rightful priority of worship in our daily lives and in the life of the Church. Little do we realise that everything hinges on understanding, appropriating and living out this Truth – that we are made to worship God and God alone. Worship of God does not demote man; it elevates him. In worship, we find our fulfillment; we reach our highest dignity, and discover our true self in God. So, God is not our competitor; He does not steal the limelight, and the worship of Him is not a distraction or in opposition to our work and mission in this world. Rather, the basis of our mission and work in the world must be prayer and worship. Perhaps, some of you may protest that this is an unfair and inaccurate assessment of our modern culture. Are we really so conceited and self-absorbed? We only need to find evidence of this claim in our own culture of worship. I’m quite sure that you know of many Catholics, and may even count yourself as one of them, who constantly complain about the mass being boring or being too long. It is boring because it is not about “us.” It is too long because worship is such a waste of time and we have little love for God. We could be better using our time to entertain ourselves. It would seem that “boredom” is symptomatic of an entertainment culture, a culture that manufactures reality TV shows, Talentime contests, and Social Media, a culture which continually demands to "feel good". The goal of such culture is never the worship of God. On the contrary, it is all about ourselves – we must be kept entertained. Hence, the mass too becomes "show time" with an unhealthy focus upon the performance, which has been adapted from a world that does not know God. 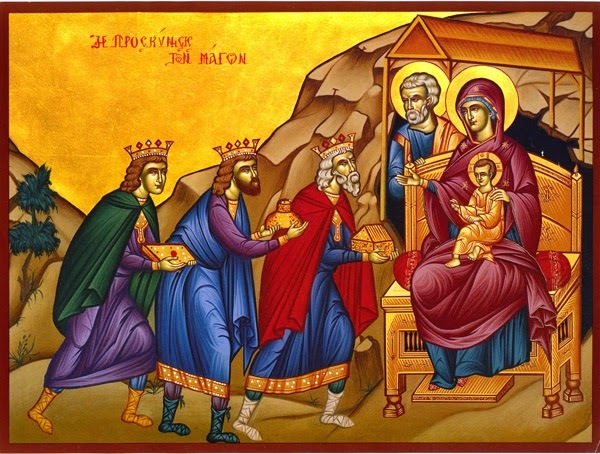 So today, in contrast to Herod who demanded worship from his subjects, we have the example of the Magi, whom tradition tells us were also kings. But here lies the difference. Those who were in the custom of having others bow and even prostrate before them, now humbly bow before this seemingly powerless and insignificant Child. Rather than expecting adulation and praises from others, the Magi teach us that true worship comes in the form of losing one self to the divine. As the Star guided the Magi to worship at the crib of Our Lord and Saviour, let us be guided by this liturgy to worship Him in the Most Holy Sacrament of his Body and Blood. And if you do get to sing that beautiful hymn with its chorus resounding; “Venite Adoremus!” “O Come Let Us Adore Him”, remember that it does not only bid us to obey God, or to serve Him, to strive, to live or die for Him; all of that might come in good time, but for today, the call is to adore and to worship. And that is what we must do, not just for today, but for the remainder of my life here and for all eternity thereafter. ".........but for today, the call is to adore and to worship. And that is what we must do,........."
thkq Fr for timely reminder.